This Hinkley Marina 2 light flush outdoor porch light with ribbed holophane glass shade is finished in hematite and rated IP44. Featuring a circular ceiling mount and curved protective cage in cast aluminium, finished in hematite with curved ribbed holophane glass shade to diffuse the light. An eye catching porch light with a nautical influence that is the ideal choice for any modern or traditional style. 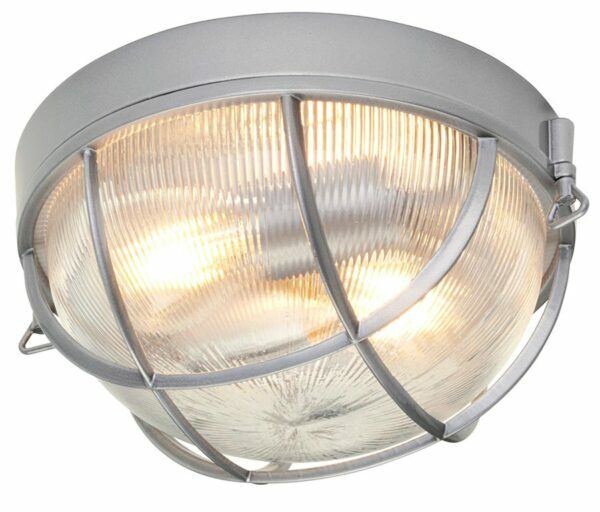 May also be used as a wall mounted outdoor bulkhead light, please see secondary image for details. Set sail with Marina. Inspired by authentic ship passageway lighting, its die-cast aluminium construction uniquely emphasizes the captured clear holophane glass. The robust hematite finish showcases the fresh, modern-nautical cast cage design. Holophane glass is named after the company who invented it in the 1890’s and is a generic term for clear moulded glass with parallel or crosscut prisms. In 1896 they described the glass as having a luminous appearance over its entire surface and having great beauty as well as illuminating power. If you are searching for quality outdoor lighting in a nautical style, the Marina suite should be considered. Fully weatherproof and supplied with a manufacturer’s 3-year anti corrosion warranty, which relates to the corrosion of finishes on cast aluminium lights like this one. Locations within 5 miles of the coast are excluded. Exterior fittings must have an IP (Ingress Protection) rating which indicates the fittings ability to prevent solids and liquids penetrating the enclosure. The higher the number, the greater the protection. The minimum rating for an outside light exposed to the weather is IP23. This fitting is rated IP44. There are matching fittings in the Marina collection that include small and medium outdoor wall lanterns; please see below. This outdoor light is supplied by Elstead Lighting and designed in the USA by Hinkley, founded in 1922 in Cleveland, Ohio. They have transformed from a small outdoor lantern company to a global brand intent on bringing you the best in style, quality and value designs like the Marina 2 light flush outdoor porch light with ribbed holophane glass shade featured here.